Last season, Jordan Howard ended up being the No. 2 rusher in the league, this season he wants to be No. 1. “I’m definitely trying to be the No. 1 rusher in the league this year,” Howard told a Chicago Tribune reporter back in June. Right now, that title belongs to Dallas running back Ezekiel Elliott. And with the recent news of his suspension being put on hold, he will be Howard’s biggest competition for the rushing title. Elliott finished with 1,631 yards and Howard 1,313. The second-year back from Indiana has set the standard high for himself but by no means is it unobtainable. Unlike Elliott who started week 1, Howard wasn’t pegged as the team’s starter until week 4 of the season. The Bears had Jeremy Langford as their starter and after he was injured week 3 against the Cowboys, Howard took over with 11:11 remaining in the second quarter of the game. But going into week 4, Elliott already accumulated 274 yards rushing (140 came against the Bears in week 3). Howard on the other hand only had 67 yards rushing. 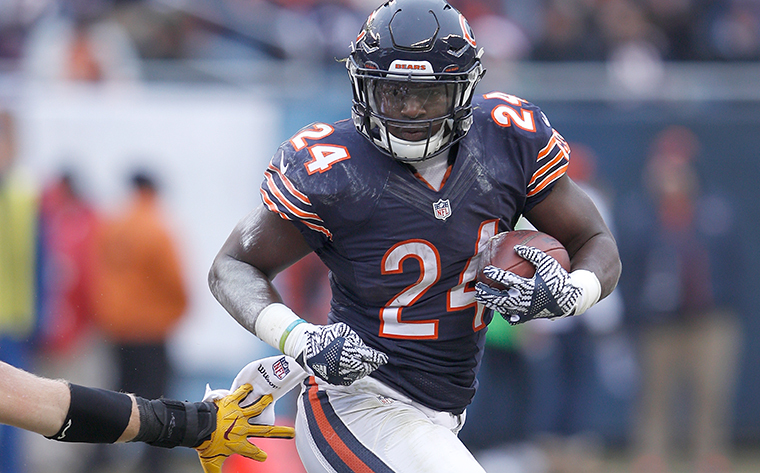 The Bears’ running back didn’t play in week 1 and carried the ball 12 times total in week’s 2 and 3. Seven times Howard had 100 or more yards rushing last season, which was tied for first in the league with Elliott and Buffalo Bills running back LeSean McCoy. In those seven games, Howard took advantage of teams who came into the 2016 season with a rushing defense that was in the bottom half of the league. Howard also took advantage of the opportunities he had last season. Amongst the top five rushers in the league, Howard had the least amount of carries. Out of the top 10 rushers in the league, Howard also came in second with 5.2 yards per rushing attempt, only behind McCoy. What Howard was able to accomplish in his rookie season was astonishing and there is no reason to believe he won’t progress in year 2. Going into this season, Howard is the Bears’ No.1 running back. Elliott won’t get a head start like he did last season and that will make the race to claim the rushing title interesting. One aspect of Howard’s game that he has worked on going into 2017, is finishing his runs in the end zone. Over the offseason Howard worked on losing weight and conditioning himself for longer runs. There were countless times last season where Howard was caught from behind after breaking off a big run. What will also help Howard in his pursuit of winning the rushing title is the opponents he will face this season. The Bears will face nine opponents in the bottom half of the league in terms of rushing defense. Amongst those nine are the two worst rushing defenses in the San Francisco 49ers and Cleveland Browns. Two of the Bears’ division opponents the Vikings and Lions have the 20th and 18th worst rushing defenses respectively and Howard eclipsed 100 yards on both teams last season (twice on the Vikings). With Howard recently getting PRK eye surgery in the offseason to give him 20/20 vision and the schedule ahead, the rushing title should be right in his sight. The Bears currently don’t have many options on offense, which will allow Howard to carry the workload. Mike Glennon and a bunch of no name receivers will be asked to try and move the ball in the passing game. Glennon isn’t a quarterback who is going to throw for 300 yards a game and it doesn’t help when he has limited vertical threats. Last season, Kevin White, Kendall Wright, Markus Wheaton, Deonte Thompson and Josh Bellamy combined for 93 catches and 1,185 yards. But luckily for Howard, he has some of the best blockers in the league. If and this is a big if, the starting o-line stays healthy all season, the Bears could have three Pro Bowlers. It starts with left guard Kyle Long, who is still trying to recover from an ankle injury he suffered last season. But when healthy he is one of the best guards in the league. Center Cody Whitehair emerged as a star in his rookie year and should only get better in year 2. And right guard Josh Sitton has made the Pro Bowl at both guard positions, his play speaks for itself. The Bears also have four tight ends and a fullback on the 53-man roster. There is no confusion here, the Bears’ offense is going to rely heavily on the running game and opponents better be ready for the physical style of play. Once Howard takes off there will be no catching him and it all begins on Sunday against the Falcons.